With the cold, rainy weather we’ve been having here in SoCal lately, I’ve been a soup making machine. My kids LOVE soup, so it’s a great meal to make for the family, since everyone will eat it. I really like soup – it fills me up and it’s easy to make. Plus, soup is so easy to freeze for later. I can make up a big batch and then freeze part of it for when I need a quick, healthy and filling snack later. Recently, I made a truly amazing soup for lunch. My daughter’s favorite lunch is grilled cheese sandwiches, and, of course, tomato soup is the perfect complement to grilled cheese sandwiches. 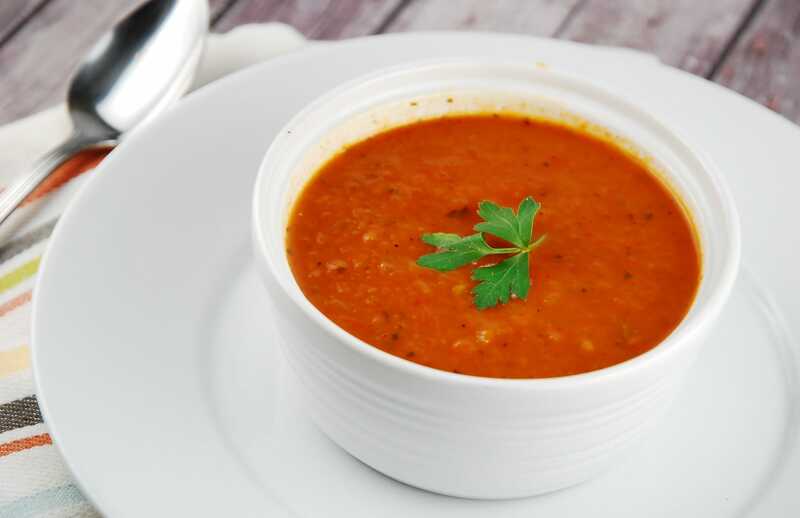 But instead of the traditional tomato soup, I thought I’d jazz it up a bit by adding red pepper and roasting both the peppers and the tomatoes. Ordinarily, when it comes to making meals for my family, I’m all about things that I can whip together quickly and easily. But sometimes, guys, you just have to put in the time in the kitchen because it’s so much better. And let me tell you, this Roasted Red Pepper and Tomato soup. Oh Em Gee…this was SO delicious! Since I made the whole soup from scratch I was able to use fresh and delicious ingredients. One of the advantages of living in SoCal is that we often have quality fresh produce year-round. I grabbed some fresh red pepper and tomatoes, onion and garlic and set to work. And this turned out amazing, it was light, brightly flavored and wonderfully fresh. I’ve made homemade tomato soup before, but this one brings the classic tomato soup to a whole new level. The key to this soup is roasting the vegetables. Roasting vegetables is not only a great way to prepare side dishes for your meal, but it’s a wonderful way to infuse your soups with extra flavor. Roasting the peppers, tomatoes and garlic gives the vegetables a slightly smoky flavor that really just brings out the sweet and fresh flavor of the vegetables. I lightly coated my veggies with olive oil from a mister. I like doing that to help keep them from burning and to get the seasonings to stick to the veggies. But since I use a mister, the olive oil is just a very light coating, so it doesn’t really add points and the veggies aren’t greasy when I get done. It also helps to line your pan with foil before you get started. It makes clean up so easy! I then season the veggies with the herbs and roast them for about 30 minutes. That’s enough to bring out the flavors and soften up the veggies so they’re easy to add to the pot. While they’re cooking, I can sauté the onions. Once the veggies are done, put everything in a pot, blend it and them simmer it to allow the seasonings and flavors to really blend together well. While this Roasted Red Pepper and Tomato Soup took longer than if I’d opened a can, trust me, it’s worth every single minute. While the soup simmers, it’s easy to put the grilled cheese sandwiches together and you’ve got a fabulous meal that everyone will love. Fresh, bright, and savory, this homemade soup is sure to become a family favorite. The flavor of the roasted veggies and garlic is what takes this soup to a whole new level. Preheat oven to 400, and line a large, rimmed baking sheet with cooking spray. Cut each tomato into about 4 slices, and cut each pepper into eighths (removing the seeds and insides). Place tomatoes, peppers, and garlic cloves onto prepared baking sheet and mist with an olive oil mister. Sprinkle the paprika, oregano, thyme, and salt and pepper evenly on top. Place in oven and roast for 30-35 minutes. Heat olive oil in a large pot. Add in diced onions, and sauté until they begin to soften, about 2 minutes. Turn heat to low, and add in the roasted vegetables and garlic cloves, tomato paste, able cider vinegar, fresh basil, and 2 cups of water. Using an immersion blender, blend well until pureed smooth. Add additional water as needed to achieve desired consistency. Season with salt and pepper to taste. Cover and let sit on low heat, stirring regularly for about 20-30 minutes. This was a great recipe! I have made it several times. Love that the sweet red peppers are in it! I really want to make this. In the direction you mention sauce, but there is no sauce in the ingredients. What sauce and how much?? Sorry…that was a typo! It was supposed to be “sauté”. I corrected it in the post. Thanks for catching that! Made this soup! Delicious! However in the directions it says to mix onions with sauce in the pan? Was there suppose to be tomato sauce in the list of ingredients? I added a small can. This looks delicious. In step three when you say to add onions and sauce, I don’t see any sauce on ingredients list. Am I missing something? Can’t wait to make. Sorry…that was a typo! It was supposed to be “sauté”. I corrected it in the post. Did I mean to say on item #3 “………and sauté until they begin to soften”? Yes…my bad! That was a typo. Should read “sauté”.